URBAN PLANNING IS A dynamic process that involves designing or planning urban spaces or urban communities. 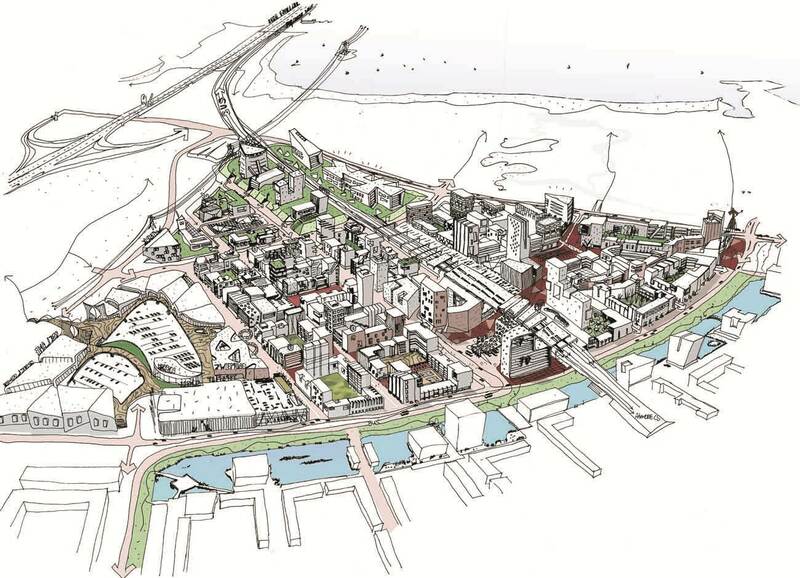 It also involves considerations ranging from land use and zoning to environmental concerns, preservation, gentrification, and issues of growth and urban sprawl. Urban planning frequently requires responding to changes in both neighborhoods and overall urban areas, including changes in the age, class and racial composition of the local area, and the changing needs of the local population. It also seeks to provide proactive solutions to potential urban development problems. planning play any role in pursuing social justice or equality? Urban environmental planning takes into account not only the various resources, including human resources (economic, political, and social resources) and environmental resources (sunlight, water, land, and fuel, for example), but the processes that convert such resources into products and services. It then evaluates the effects that such processes produce, seeking to maximize positive effects and minimize negative effects. Such processes may include transportation, migration, population growth, and manufacturing, to name a few. Desirable positive effects include the production of valued products and access to improved services and education, while negative effects tend to center on pollution and associated environmental dangers (garbage, traffic, urban congestion). An important aspect of urban planning, integral to developing effective policies and desirable designs, is consideration of the scale or scope of the impact of the urban environment and its associated problems. This is particularly true when considering urban environmental planning issues. While certain problems may manifest themselves initially at a very local level (problems with garbage collection in a particular neighborhood, for example), the potential impact of such problems can be national. Garbage left uncollected in a particular neighborhood may impact citywide recycling or trash disposal efforts. Problems with an urban region’s trash disposal system can have an impact on the surrounding environment—water supply, for example—which can impact the entire state and, if left unresolved, may have the potential to impact an even wider region. The beginnings of urban planning in the United States can be seen in the 19th century, with the rise of a progressive intellectual movement comprising of political scientists, economists, and sociologists who believed that there was a need for public intervention in the economy. The City Beautiful movement developed in the late 19th and early 20th centuries, growing out of a general discontent with urban development. Cities were thought of in nostalgic terms, but increasingly people were abandoning urban areas, and the urban neighborhoods were suffering from decay and deterioration. Tenements were growing, spawning unhealthy living conditions, poor sanitation and general squalor. In contrast to those who sought to provide social remedies to eliminate such living conditions, the City Beautiful movement, led primarily by upper-middle-class white men, emphasized restoring physical beauty to the urban landscape, and advocated planning cities as works of art, with an emphasis on beauty and landscape architecture. The movement leaders believed that restoration of physical beauty would inspire a sense of civic duty and provide a moral compass in the lowerclass urban dwellers. Contemporary debates over urban planning focus in part on issues of urban sprawl and suburban development. Urban sprawl—the spread of urban dwellers into rational, planned suburban developments—is characterized by shopping centers, office parks, residential subdivisions, and public buildings or civic institutions (schools, churches and town halls, for example). It is seen by many as an unprofitable, environmentally destructive pattern of growth. It develops land at a rapid rate and contributes to an ongoing decline of urban centers. In addition to the environmental costs, urban sprawl contributes to social problems as well, creating a world of stranded citizens: elderly citizens who have lost their driver’s licenses and are not able to access local businesses on foot, commuters who are stranded in long commutes from suburban homes to urban jobs, school-age children who are left dependent on parents for transportation, and low-income urban dwellers who are stranded in economically and physically failing cities. Contemporary urban planning is characterized by two movements, New Urbanism and Smart Growth, each of which seeks to combat urban sprawl. As David Godschalk notes, the New Urbanism movement is “an urban design movement committed to reestablishing the relationship between the art of building and the making of community, through citizen-based participatory planning and design.” It seeks to create a “coherent and supportive physical framework” within which socially and economically vibrant communities can thrive. The New Urbanism movement is explicitly fighting urban sprawl, looking to develop instead urban environments that are designed with pedestrian traffic in mind, as well as traditional automobile and public transportation. The movement supports accessible public spaces and architectural designs that reflect the historical and environmental areas within which they are located. The Smart Growth movement is, likewise, a contemporary urban planning movement, characterized by Godschalk as an “umbrella term” that covers a variety of urban planning concerns arising out of statewide growth management initiatives arising during the late 1990s. The overall concern is to develop a livable community focused on the everyday lived environment and avoid patterns of urban sprawl. In addition to addressing issues of urban sprawl, contemporary urban planners and those who research in the field of urban planning are frequently drawn to addressing how urban planning has affected (and continues to affect) racial and ethnic divisions, and how such divisions in turn shape urban planning and development. In the United States as well as Europe, cities are frequently geographically divided by race, ethnicity, and class, and such divisions are frequently expressed through spatial patterns of segregation. Influxes of immigrants into such urban environments further divide the urban environment. Urban planning in such an environment can take several forms in an attempt to address such polarization, as Scott A. Bollens notes: a neutral strategy, an equitable strategy, a partisan strategy, and a resolver strategy. As Bollens details, the neutral urban planning strategy utilizes an ethnically neutral style of intervention, involving technical criteria disassociated with ethnic identity. Any urban problems addressed by the planners are framed as nonpolitical, purely technical matters that are readily solvable through planning strategies. In contrast to the ethnically neutral style of urban planning embraced by the neutral strategy, the partisan urban strategy purposefully endorses one particular ethnic group’s values to the exclusion of lesser ethnic or racial groups. Such a strategy provides “preferential access to the urban policy-making machinery” for those of the selected ethnic group to the exclusion of other ethnic or racial groups, Bollens explains. The third strategy, equity, seeks to use ethnic identity in an effort to balance inequalities between ethnic groups. Under such a strategy, the size or resources of a particular ethnic group are used to determine the services and spending necessary for planning of a particular area. As Bollens observes, “[a]n equity planner is aware of group-based inequalities and political imbalances in the city (both historic and contemporary) and recognizes the needs for remediation and affirmative action policies based on group identity.” Finally, the resolver strategy places emphasis on the causes of racial or ethnic segregation within the urban environment, including, for example, identification of disempowerment of minority groups. Such a model seeks to create urban environments of toleration and coexistence.